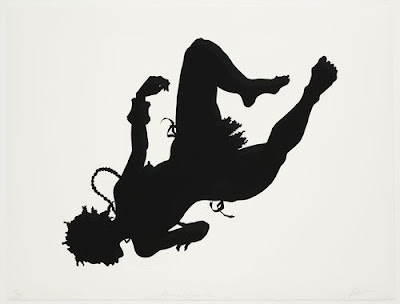 Kara Walker is known for her room-size black cut-paper silhouettes that depict very confrontational images related to race, gender, sexuality, violence and identity in the pre-war south. 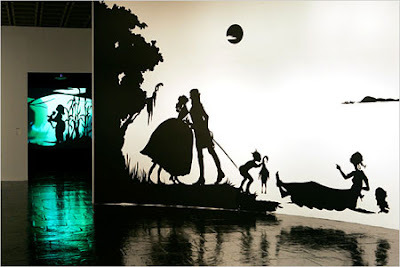 She began working with cut-paper silhouettes in 1993 as a graduate student at RISD. While I am not specifically interested in just silhouettes, I relate to Kara’s words. I knew that the medium of cut-paper was, until more recently, considered a more archaic craft and I think that is part of what draws me to it. I like the thought of working with a people’s stories in a very modest, very handmade type of material and creating “fine art” from something that is more typically considered a craft. I also like the historical aspect of papercutting – it is a practice commonly found in the histories of various cultures all over the world. Kara Walker describes her work as both visual and literary. Her storytelling is influenced by literature like southern romance novels, historical fiction, slave narratives, and contemporary novels and some texts are directly referenced in her pieces. In her pieces, Walker employs characters, setting and action to convey a story. These narratives are not always linear, however, and don’t necessarily include a clear plot line. In the Kara's words, “There is always a beginning and there’s never a conclusion.” Walker is interested in the stories we tell about ourselves, and specifically, a desire for a narrative about “African America” that engages the past, present, and future. While our topics and themes are not related, I also hope to make my illustrations both visual and literary, by becoming a storyteller for the people I speak with. My vision for my illustrations is also not linear, but instead more collage-like with all the elements of a memory coming together for an overall picture. For me, my project has been fueled by an interest in the stories people tell about themselves and the way those stories and memories are shaped. 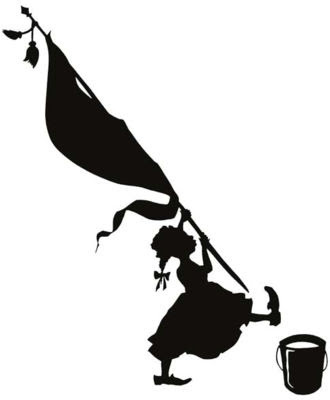 i love kara walker's work too. and i'm excited to see Lotte Reiniger's work -- thanks for posting the links. an interesting thing about the history of silhouettes is that after they were invented, the technique was disseminated but only moderately popular until a book was published claiming to show how to interpret physiognomy of silhouette portraits. this was before photography and silhouettes were the most "mechanical" way to make a portrait, so it was quasi-scientific (even though the claim to interpret personal characteristics from someone's looks and face-shape was bogus). but when this book was published, the practice of making silhouettes (and then interpreting them) took off! became extremely popular... until sometime around the invention of photography.